SPAIN: Catalonia President Declares Independence But Suspends Action To Allow For Talks With Madrid [VIDEO] - Joe.My.God. The leader of Catalonia, Carles Puigdemont, said on Tuesday evening that his region had earned the right to independence from Spain, but he immediately suspended the process to allow for talks with the central government in Madrid. “I ask Parliament to suspend the declaration of independence so that in the coming weeks we can undertake a dialogue,” he said. 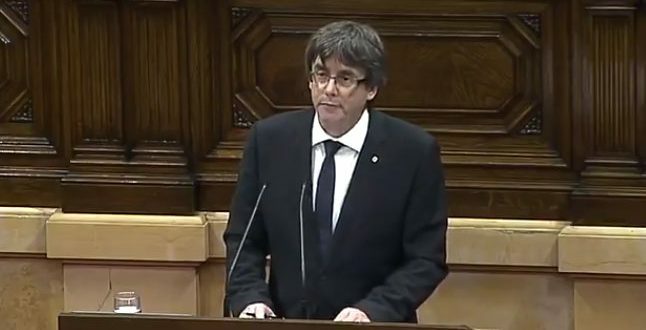 In a long-awaited speech to the regional parliament in Barcelona, Mr. Puigdemont said that Catalonia had won the right to independence as a republic free from Spain, but left open the door to negotiations and to mediation. Prime Minister Mariano Rajoy of Spain has rejected any dialogue with Catalan separatists unless they abandon plans for secession, and Mr. Puigdemont and his allies are now in danger of arrest for sedition, and the Catalan parliament at risk of being disbanded. Catalonia: i want a divorce, but not yet. Spain: So there’s still hope? Catalonia: Not really I just worry you’ll beat me up if I go now.